The Interpol virus (aka. Interpol Department of Cybercrime virus) is another destructive Ukash ransomware created by cyber criminals, which restricts access to the affected PC and demands a ransom paid to a bogus notification in the name of legitimate Interpol Department organization. 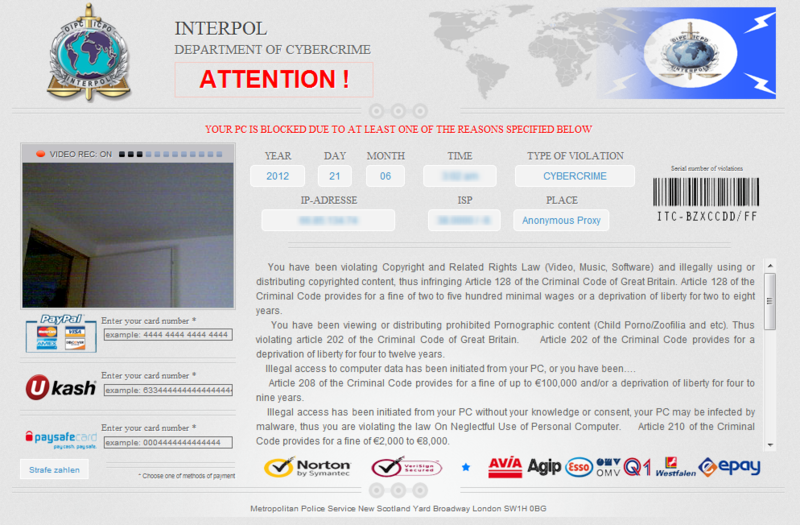 The Interpol virus scam mainly attacks the PC users from European and North American countries. Upon its installation on a target PC, a misleading message will cover the computer screen voluntarily , which stats that your computer has been locked due to it being in volved with violating Copyright and Related Rights Law (Video, Music, Software) and illegally using or distributing copyrighted content. What’s more, according to your impertinent behaviors, a demanded fine of 100 euros or 100 pounds is required to release your locked PC. You may pay fine through Ukash or Paysafecard within 72 hours after the infringement, or worse punishment would happen to you. However, no matter how many items the alert emphasize, it has nothing to do with the lawful Interpol government and is only a fake notification utilized to coax victims to pay non-existent fine on it.